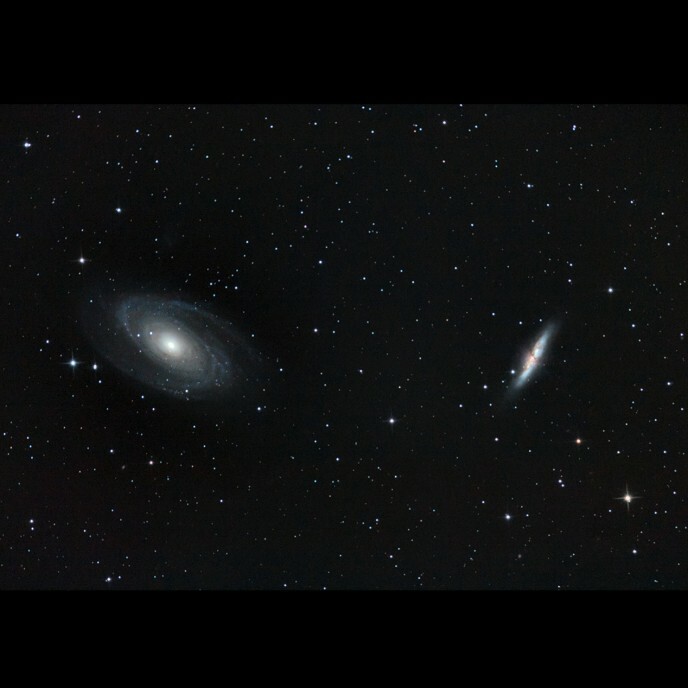 The M81 and M82 galaxies are often shot as a pair due to their apparent proximity to each other. In March 2017, I photographed this photogenic pair of galaxies using the ZWO ASI017MC-Cool Camera from my backyard. The reason the data in this image had so little noise was due to the cooling feature of the camera used. 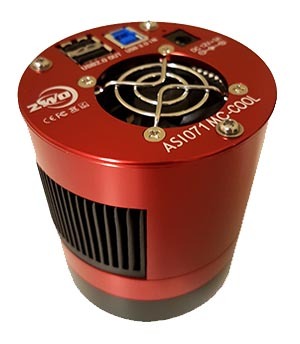 The ASI071 is equipped with a 2-stage TEC cooling system that can bring the camera to -40 degrees celsius below ambient. It was a pleasure to process data this clean. I was also able to maintain the details of the image almost right to the edge of the frame. The final image was only cropped to about 90% from the original size. The quality of the background sky was the biggest difference between this version and my previous attempts using my DSLR. Using flat calibration frames made a large impact, and were obtained using Sequence Generator Pro. The color balance of the image is a little different than I used to with the Canon 600D. Specifically, I find the blues to be a little lacking. I hope to learn more about correcting the color balance of the images taken with the RGGB Bayer pattern on the ASI071. This photogenic pair of galaxies resides in the constellation, Ursa Major. They are relatively easy to find with binoculars when you start at the Big Dipper. 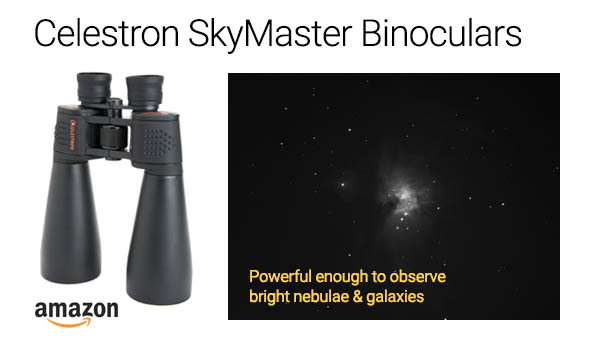 It is rare to have two bright, large galaxies within the same field of view, which make this pair a popular choice for astrophotographers. Also cataloged as NGC 3031, Bode’s galaxy is a spiral galaxy about 10 degrees northwest of the star, Dubhe. 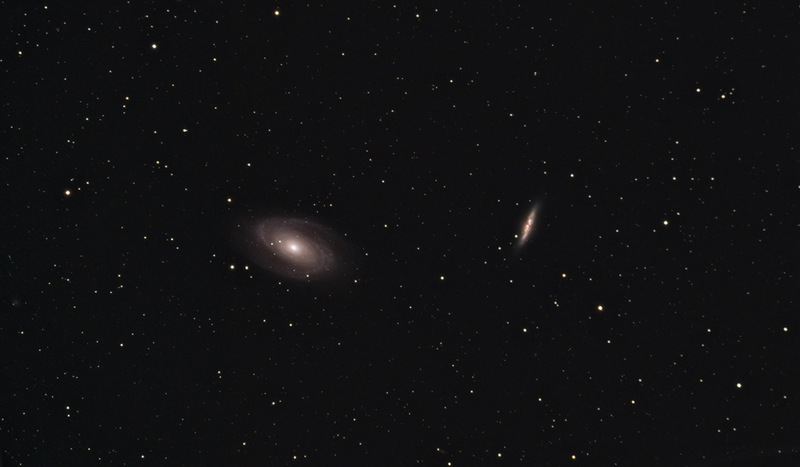 Larger telescopes will reveal the spiral structure of M81 under dark skies. The Cigar galaxy is an edge-on galaxy only 38 arc-minutes from M81. This galaxy appears as a “rod of light” in modest telescopes, while larger ‘scopes will reveal the dark patches across the surface. M81 and M82 may seem close together in the night sky, but they are actually 150,000 light years from each other! This galactic pair is best observed in the spring, which is when this photo was taken. This photo was captured using a Canon Rebel Xsi (stock) and an Orion 8″ Newtonian Astrograph Reflector. 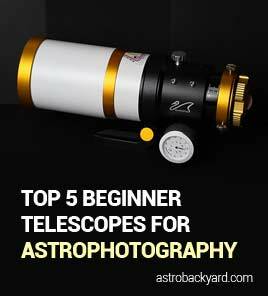 This telescope is larger than my primary imaging telescope (Explore Scientific ED102) and can collect more light in a shorter period of time.